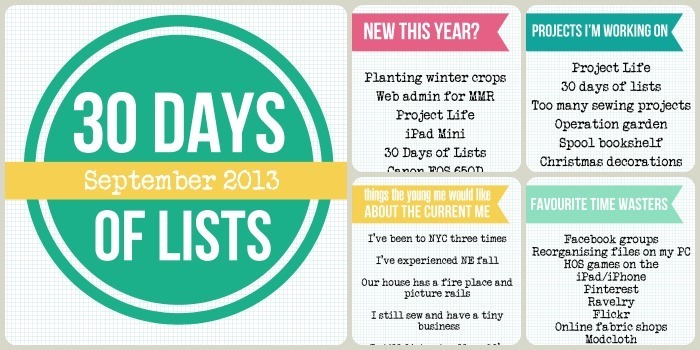 This month I’m participating in 30 Days of Lists. The basics of this challenge, is that every day a new prompt is released and you create your list from that prompt. There’s no right or wrong day to complete the challenge and people are creating their lists on sticky notes, to moleskines, and everything in between! I saw this post which was my main motivator for signing up. I loved the way she incorporated her list into her Project Life album and decided that this was the approach for me. I’ve created a simple template in Photoshop which I just type my list into each day. If I haven’t had a chance to use the computer I make my list using evernote, then just paste it into the template the next day. Here’s a glimpse of my lists so far. I haven’t settle completely on the list font yet, and I will go back and change the font size so each list is uniform once they’re all complete. Once the month is up, I’ll have my lists printed, then slot them in a Project Life Design F pocket.